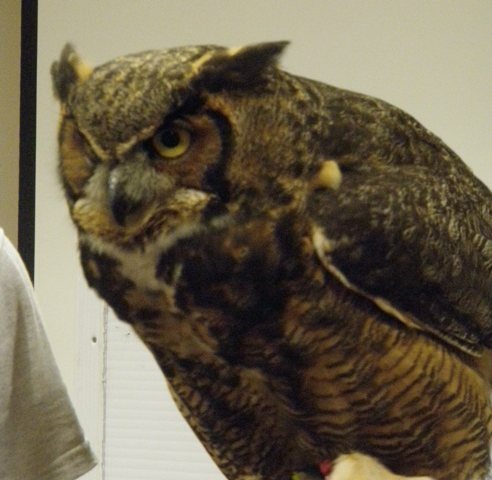 North Atlantic Canoe and Kayak had its monthly meeting featuring wildlife rescue and rehabilitation, on April 17, 2012 at Bellport’s South Country Library. Ann started the meeting with a discussion about the benefits of yoga for preparation in Kayaking. Ann, assisted by Steve and Renee´, demonstrated some basic Yoga positions. Ann demonstrated and explained how much more movement one has for paddling, when their muscles are stretched and relaxed. The attending members agreed with Ann that it would be good to have a yoga session one night complete with movies and members performing the actual exercises at one of our future meetings. Following a short discussion of various NACK business matters, the focus of tonight’s meeting was set to begin. Kerri Dobbs represented the Evelyn Alexander Wildlife Rescue Center of the Hamptons, by starting out showing us a very informative Power Point presentation, providing lots of information on how we either could or could not assist various wildlife-in-need, which we may come across while we are kayaking. We all learned many new things, and we’re all a bit shocked about the “Old Wife’s Tale” about not returning a baby bird which fell out of its nest. The tale says the parent bird will reject the baby because of the humans smell. Kerri explained that the theory was not correct, as birds do not have a sense of smell. 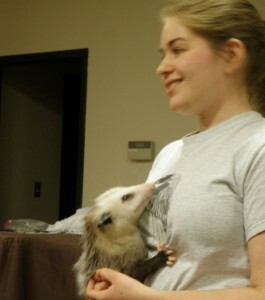 The opossum Kerri is holding was actually rescued from the pouch of its dead mother. If you ever find a dead female opossum, it was suggested to check the pouch for young, and if possible, get the animal to a shelter, as there could be up to 13 babies of the 40 fingernail size births, still alive attached to the mother’s feeding tubes. Kerri brought along four animals that the Center had rescued. These animals all had severe injuries, and although are all mainly rehabilitated, none of them could survive in the wild, and can’t be released. One simple thing we kayakers can do to save the animals, is to pick up and dispose of potential life threatening traps, such as plastic bags, netting, fish hooks and line. These are all potential accidents waiting to happen. So if you see an injured turtle (be careful of snapping turtles), bird, rabbit, opossum, amongst others call for help. If you find a sea bird entangled in fish line, you, could do as Steve one time did, cover the bird with your shirt, which renders the animal harmless, while you remove and dispose of the fishing line. 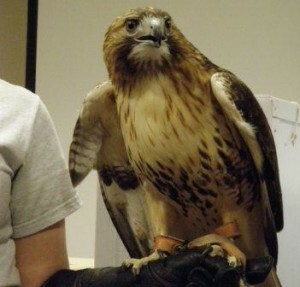 Kerri was kind enough to provide us with a listing of other wildlife rescue organizations and rehabilitators in the event one of us should discover an animal in need. She stressed that time is of the essence and one should not hesitate to call. While many of these animals may look like they might make good pets this is definitely not the case. They have special needs and will not fare well in captivity. Besides that possession of wildlife is strictly regulated by the Department of Environmental Conservation. 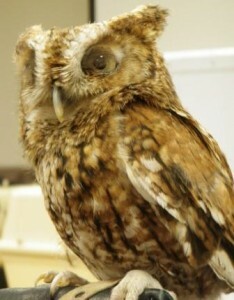 Animal rehabilators need special training and are required to be licensed. This was a wonderfully educational and enjoyable presentation by Kerri. From beginning to end, this was another great meeting. Thank you Dara, great job! I would like to thank Dara who spent hours on behalf of NACK contacting, coordinating and making the arrangements with both the Evelyn Alexander Wildlife Rescue Center of the Hamptons and The Riverhead Foundation of Marine Research and Preservation making both their presentations possible this year.